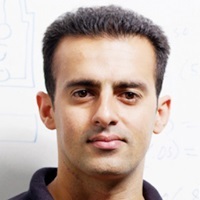 Prof. Roozbeh Ghaffari obtained his BS and MEng degrees in electrical engineering from the Massachusetts Institute of Technology in 2001 and 2003. He received his PhD degree in biomedical engineering from the Harvard Medical School-MIT Program in Health Sciences and Technology in 2008. Upon completion of his PhD, Dr. Ghaffari co-founded MC10 Inc and served as its Chief Technology Officer. In this role at MC10, Dr. Ghaffari shaped the technology vision of the company helping launch disruptive wearable systems like the BioStamp® and the My UV PatchTM. Prof. Ghaffari's contributions in soft bioelectronics, micro/nano-scale systems, and auditory neuroscience research have been recognized with the Helen Carr Peake PhD Research Prize (2008), the MIT100K Grand Prize (2008), the Harvard Business School Social Enterprise Grand Prize (2008), MIT Technology Review Magazine's Top 35 Innovators Under 35 (2013), and TEDx Gateway invited talk (2016). Prof. Ghaffari joined the Center for Biointegrated Electronics at Northwestern University in May 2017, where he serves as Director of Translational Research working at the intersection of basic and translational bioelectronics research. McGinnis, R. S., Mahadevan, N., Moon, Y., Seagars, K., Sheth, N., Wright, J. A., DiCristofaro, S., Silva, I., Jortberg, E., Ceruolo, M., Pindado, J. P., Sosnoff, J., Ghaffari, R., and Patel, S. A machine learning approach for gait speed estimation using skin-mounted wearable sensors: From healthy controls to individuals with multiple sclerosis. PLoS ONE. 12: e0178366 (2017). Kim, J., Ghaffari, R. and Kim, D.-H. The quest for miniaturized soft bioelectronic devices. Nature Biomed. Eng. 1:0049 (2017). Swanson, C. D., Lee, S., Aranyosi, A. J., Tien, B., Chan, C., Wong, M., Lowe, J., Jain, S. and Ghaffari, R. Rapid light transmittance measurements in paper-based microfluidic devices. Sensing and Biosensing Research. 5:55-61 (2015). Song, D., Lee, J., Qiao, S., Ghaffari, R. et al. Multifunctional wearable devices for diagnosis and treatment of movement disorders. Nature Nanotechnology 9:397-404 (2014). Ghaffari, R., Page, S. C., Farrahi, S., Sellon, J. B. and Freeman, D. M. Electrokinetic properties of the mammalian tectorial membrane. Proc. Natl. Acad. Sci. USA. 110:4279-4284 (2013). Kim, D.-H., Ghaffari, R., Lu, N. and Rogers, J. A. Flexible and stretchable electronics for biointegrated devices. Annu. Rev. Biomed. Eng. 14:113-1128 (2012).